This website was created by the Information, Hospitality, and Special Events Subcommittee of the April 2016 Conference on College Composition and Communication (CCCC) to be held in Houston, TX. Chaired by Dr. Nathan Shepley, Assistant Professor of English at the University of Houston, this subcommittee offers CCCC attendees local information tailored to their needs, information from citywide attractions to important downtown resources. Dr. Jen Wingard, Associate Professor of English at the University of Houston, is Chair of the CCCC’s Local Committee, of which the Subcommittee on Information, Hospitality, and Special Events is a part. Our website reflects interests of many college faculty members who teach writing courses. So, for example, we have a page called Literary Houston with details about unique local bookstores and literacy groups and events. The site will continue to grow throughout early 2016, so check back regularly. Specific questions about Houston may be addressed to Dr. Shepley at hospitalitycshouston@gmail.com. Kate Highfill serves as the website manager, designer, and coordinator for the Hospitality Committee. She is a doctoral student beginning her second year in the University of Houston’s Rhetoric, Composition, and Pedagogy program. Georgeann Ward will serve in the Hospitality Booth at the conference. She is an English and Humanities instructor and the Honors Program Coordinator at Lee College in Baytown. She is also a second-year doctoral student in the University of Houston’s Rhetoric, Composition, and Pedagogy program. Ben Good will work in the Hospitality Booth at the conference. He is a doctoral student beginning his third year in the University of Houston’s Rhetoric, Composition, and Pedagogy program. Welcome to Houston! To many, Houston represents big oil, big houses, and big opportunities. And that’s exactly the reputation many Houstonians like to cultivate about our fair city. But there’s a lot more to Texas’ biggest city that doesn’t get into the papers. And lucky for all of you, you now get to explore and experience some of it! For those of us who are non-native Houstonians, which is the majority of the city’s population, we have grown to love the contradictions that comprise the soul of our city. In fact a famous Houston-transplant, poet Mark Doty, writes of Houston as a city of big skies, no zoning, confusing planning, continual construction, and cultural hybridity. He reminds us that here on the oil rich gulf coast, everything is built for the culture of the car, leaving Houston to sprawl like a suburb – not really a city at all –taking on a “new kind” of American urban identity. Houston is “polyglot, open ended, divergent, entirely unstuffy, and appealingly uncertain of itself.” For Doty it is economic opportunity coupled with cultural diversity that allows Houston to continually renew itself. History is in the past, and Houston is always looking forward. I have yet to find a better description of Houston and its rich cultural offerings and economic commitments. Like most large cities, you can find almost anything here in Houston – James Beard Award winning restaurants, miles of well-maintained green space, high-end fashion and shopping, and an internationally recognized museum district. But unlike most larger cities, all of these amenities are offered without pretense – fine dining is found in strip malls or converted warehouses; high-end couture is sold at the mall; and folks enjoy a Sunday of grand opera in jeans and t-shirts. Right in Downtown, across the street Hilton of the Americas – the conference hotel – you will find Discovery Green, a 12-acre LEED certified oasis in the middle of the city filled with art, activities, and fine locally sourced dining at the Grove. In a short bus, light rail ride, or brisk walk, you will find historic Market Square Park filled with entertainment, trendy bars, and eateries. 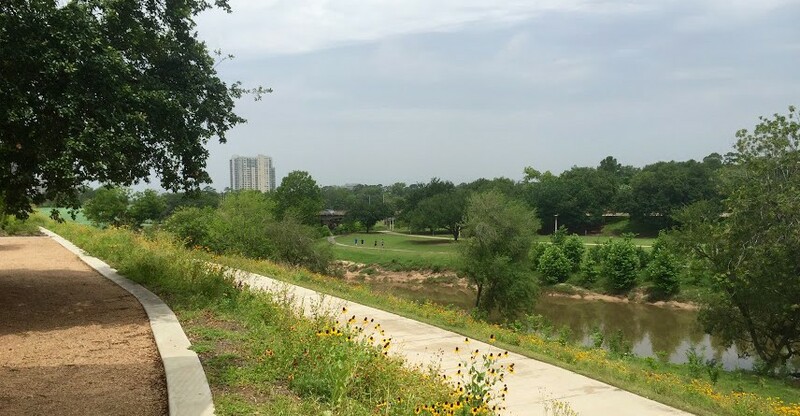 And one of the last stops on the Greenlink (downtown’s free bus service) is Buffalo Bayou Park – a terrific 10-mile stretch of car free green space with paved running and biking trails that can lead you to both the Heights and Montrose neighborhoods filled with shopping, dining, and nightlife. The Montrose (2.6 mi away) is Houston’s historic LGBT neighborhood. And as such, it is full of businesses that support if not champion future efforts on behalf of the Houston Equal Rights Ordinance (HERO). The Montrose is nestled right next to Houston’s Museum District (3.2 mi), and both offer a variety of eclectic shops and dining. The Heights (6.4 mi) is one of Houston’s fastest growing historic neighborhoods (how’s that for contradiction!). It now rivals The Montrose as Houston’s “hippest” neighborhood with upscale ice houses, award-winning restaurants, and artisan shopping on trendy White Oak Drive (5.0 mi), 19th Street (7.0 mi), or The Washington Corridor (3.5 mi). Each of the neighborhoods mentioned above are within a quick METRO (Houston’s public transit) or cab ride from the conference hotel, but if you are more adventurous and want to rent a car to explore more of the greater Houston area, there are many worthy destinations “outside the loop,” as Houstonians would say. Just outside the 610 Loop to the East is Houston’s Chinatown (12.7 mi), said to rival Los Angeles in its diversity of offerings. Near Chinatown is the Mahatma Gandhi District (9.7 mi) offering food, shopping, and a cultural hub for Houston’s South East Asian population. To the west, in addition to wide-open swaths of farmland, you can find one of Texas’ top rated Barbeque joints – Killen’s BBQ (15.5 mi) in Pearland is not to be missed by the carnivores amongst us! To the south, you can find Houston’s celebration of its commitment to NASA – Johnson Space Center (25.2 mi). It’s a wonderful museum and educational center dedicated to all things space. If you keep going south on I-45, you will end up at the gulf coast on Galveston Island (54.1 mi). In addition to lovely beaches, Galveston is full of historical landmarks, excellent seafood, and entertaining activities for adults and children, too. To the north is one of Texas’ earliest planned communities – The Woodlands (32.5 mi). What began in the 1970s as an environmentally conscious suburban community has grown into a premiere site for shopping, dining, and an excellent example of suburban planning. As a large city, Houston does indeed sprawl, but it is that space that allows for a multitude of offerings, opinions, and openings for change. In fact, it is Houston’s ability to continually re-invent itself that is central to the city’s identity. And this continual renewal allows for continued discussion and change on important issues for those of us who live here, such as the Houston Equal Rights Ordinance (HERO), even after the votes have been cast. Houstonians know that change will come; it’s just a matter of knocking down some walls to do it. So welcome and enjoy exploring Houston. Before you arrive, stop by (http://www.visithoustontexas.com/) on the web to help get the lay of the land. And once you have arrived, please be sure to visit the Hospitality booth and pick up a local guide or visit us on the web (http://4chouston.com). We have detailed information about all the locations mentioned here and many, many more (including a listing of HERO supporting businesses!). You can find most anything you look for here in Houston, and often you will find a few surprises as well. The Local Committee is glad you are here!